Schiphol Cargo has reported a 2.3 per cent volume increase in belly cargo figures, as China and the US remain the strongest markets, and an extension of the network leads to growth in Latin America. The mid-year figures show overall freighter volume has decreased by 2.7 per cent to 843,842 tonnes, compared with 2017, due to a 9.4 per cent decrease in full freighter air transport movements (ATMs) and the ongoing restrictions on slot availability. 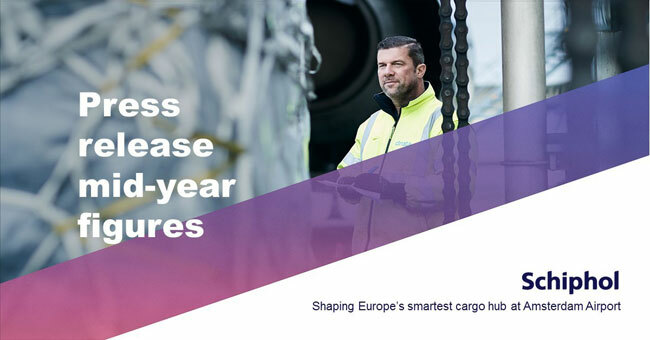 "The mid-year figures reflect our expectations for a decrease in overall freighter ATMs as we continue to face capacity constraints," said Maaike van der Windt, Director Aviation Marketing, Cargo and Customer Experience (ACC). "However, the increase in belly volume is a positive development for Schiphol Cargo due to a slight growth in passenger flights since last year, and an expanded network across Latin America. "Shanghai remains our main destination through the continued increase in e-Commerce in China, reaching more than 31,000 tonnes in the first six months of 2018, followed by the US with more than 22,000 tonnes." Despite the increase in e-Commerce, the Asian inbound market was down by 2 per cent to 147,122 tonnes, while outbound decreased by 3 per cent to 150,623 tonnes. European figures show a 7 per cent inbound decline to 55,821 tonnes, compared to the same period last year, and outbound was down by 4 per cent to 59,452 tonnes. The North American market saw an 11 per cent inbound downfall to 64,768 tonnes, and a decrease in outbound cargo of 4 per cent to 79,055 tonnes. The Latin American market shows positive growth due to a network extension on the continent with inbound cargo up 9 per cent to 65,255 tonnes, and a 15 per cent increase in outbound cargo to 40,445 tonnes. The African markets showed positive outbound results with a 7 per cent increase in cargo to 26,674 tonnes, while inbound cargo decreased by 5 per cent to 56,733 tonnes. The Middle Eastern region went down by 2 per cent (inbound), and 11 per cent (outbound) to respectively 42,666 and 55,218 tonnes. Van der Windt adds, "Although Schiphol is facing slot constraints, we are geared towards maintaining cargo volume in the years to come."